Watch out crackers from a safe distance. Store the fireworks at a safer place. Organize a community display of fireworks rather than individuals handling crackers. In case of major burns, after extinguishing the fire, remove all smoldering clothes. Wrap the victim in a clean bedsheet. If you find any eye burns, wash the eye with tap water for 10 minutes and take the victim to a hospital. Don't ignite fireworks by holding them in your hand. Don't bend over or move close to the fireworks when being ignited. Don't attempt to make fireworks at home. Don't allow small kids to handle fireworks. Don't carry fireworks in the pocket. Don't light firecrackers in narrow by lanes; preferably use open areas and parks. Don't wear synthetic clothing; preferably wear thick cotton clothing. Don't drive recklessly while taking a burn victim to the hospital; a delay of up to one hour is immaterial. Thus, awareness campaigns are launched so that fatalities and injuries caused by fireworks could be brought down. 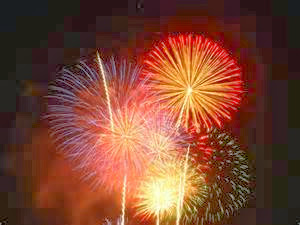 All mishaps due to fireworks occur as a result of carelessness, negligence and ignorance. Simple precautions can help avoid these mishaps.